Our mission is to develop a relationship with all D.C. Everest alumni, community members, and local businesses in an effort to recognize alumni, provide scholarships and gain support for activities that enrich the educational experiences for current students. Founded in 1995, the D.C. Everest Alumni Association exists as a subsidiary of the D.C. Everest Education Foundation, Inc. and helps provide linkage of the Education Foundation to the community. The Alumni Association also provides assistance with class reunions and promotes awareness of the Education Foundation to graduates of D.C. Everest High School. 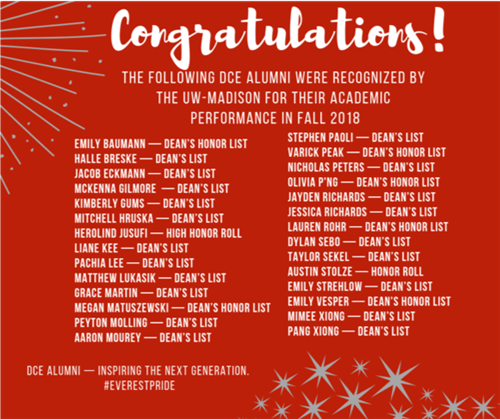 D. C. Everest Alumnus Varick Peak (’18) received the Rod and Diana Lakes Scholarship in Engineering Mechanics for his outstanding academic record at the University of Wisconsin-Madison. D.C. Everest Alumna Samantha Dulak (’12) was recently named as a Fulbright U.S. Student Program award recipient. 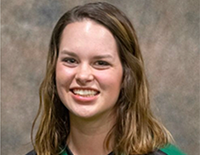 Ms. Dulak received a Fulbright Teaching Assistantship in Brazil for the 2018-19 academic year. 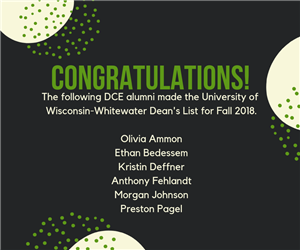 Congratulations to D.C. Everest alumni for being named to the Fall 2018 UW-Madison Dean’s lists.